An important skill related to moving the wheelchair is propulsion. Wheelchair propulsion using both upper extremities is the primary means of maneuvering a manual wheelchair. There are two distinct phase during a wheelchair propulsion cycle; the propulsive or push phase which starts when the hand comes into contact with the pushrim and continues until the point at which contact is removed at the end of the stroke. The recovery phase is the period in which the hand is not directly engaged with the pushrim so involves the motion when the hands disengage from the pushrim until the upper extremities swing back to contact the pushrim once again for the start of the next propulsive phase. In the research four types of propulsion patterns have been identified; arc propulsion, single loop over propulsion, double looping over propulsion, and semicircular which vary based on the trajectory of the hand when the hand is in the recovery period. This variability in propulsion techniques may be due in part to the level and type of impairment but also relate to the level of wheelchair skills training the user has had access to. Greater weight on the front wheels cause greater friction, but at the same time it makes the chair more stable. A standard wheelchair has a weight distribution of 50/50%, while an adjustable lightweight chair (according to the adjustment) has a distribution of up to 80% weight on the rear wheel and 20% on the front (approximately). This makes it roll better than a standard wheelchair but is less stable, thus requires greater skill to use. Soft ground produces greater friction and therefore requires more effort to propel the wheelchair. Friction is much less on hard terrains or surfaces. Pneumatic (air filled) wheels are more comfortable as they provide better cushioning, but as they are softer also provide a greater resistance to roll. A correctly inflated pneumatic tyre rolls more easily than an under inflated tyre. Many clients avoid pneumatic castor tyres because they are troublesome and puncture easily. Solids on the other hand are much harder, thus reduced resistance but provide less cushioning to the user. Small wheels have less friction because they have less contact surface with the floor but users feel less control, while larger wheels have better grip, but produce greater friction as they have a larger contact surface. Large wheels are more recommended for exteriors, and uneven floors, while small wheels are better for indoor use and to practice sports as they turn quicker on smooth and hard surfaces. However, the right size is determined by the combination between the surface on which the wheelchair will be used, the weight distribution in the wheelchair and the type of activities that the wheelchair user is involved in. Long wheelbase tends to keep the course better, goes in a straight line (That's why the racing chairs are very long). Short wheelbase is smoother and easier to turn or handle around obstacles (That's why basketball chairs tend to have this shorter distance). Caster wheels are at 90º in order to keep the same mechanical balance in all directions. if the angle is more open or less open, the front part of the frame will be higher or lower depending on the direction and will create additional resistance and friction to movement. The assembly of the wheelchair must ensure effective propulsion together with minimum energy expenditure. 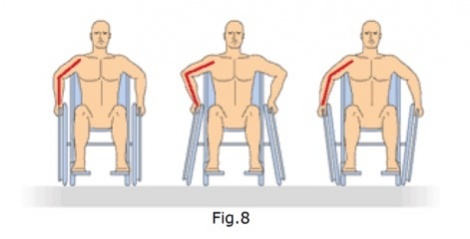 Each user has a different propulsion capacity due to their personal circumstances, which at times can be limited.That is why it is important to keep in mind the following significant factors that will impact on chair composition according to each user needs, in order to optimize the propulsion. The degree of mobility that the user has in the trunk, shoulder, elbow, wrist and fingers can limit the possibility of carrying out the entire optimal propulsion route. If the user has good mobility in these joints, the most effective pushing technique is indicated in Fig.1 starting from behind the trunk finishing at the level of mid thigh. In this way, the muscles activity of the arm allows the good application of forces. To be able to propel correctly and take advantage of all the energy of during propulsion, the user must be correctly seated (erect) in a symmetrical sitting position. 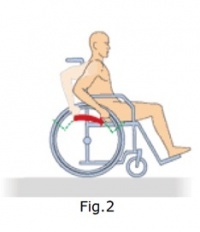 In this position the user can fully reach the push rims and perform the full movement of the arm, to start the propulsion of the wheel from behind, applying force throughout the full movement. 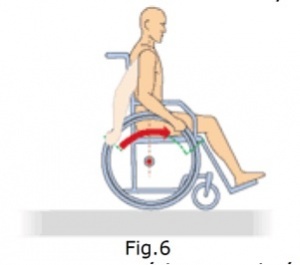 If the user slides forward in the seat as indicated in Fig.2, the push rims will be too high and it can be uncomfortable to start the propulsion from behind, so the user will tend to start the push more forward on the wheel, thus have a shorter and less efficient push stroke. To achieve more efficient propulsion, the rear wheels should be located so that the user can touch the axle of the rear wheel with the fingertips with a relaxed shoulder (Fig. 3). If the axle of the wheel is higher than indicated, the push rim will also be high, and the user will have to flex the arms more to propel (Fig. 4), which can make propulsion more inefficient and uncomfortable. The same happens if the axle of the wheel is lower than the tip of the fingers. The user will have to perform the propulsion with the arms extended and will not be able to apply the necessary force for propulsion (Fig. 5). The height of the cushion can also impact and change the height of the centre of gravity so the height of the cushion should be taken into account while preparing the wheelchair. This same rule also applies in relation to the optimal position of the wheel. 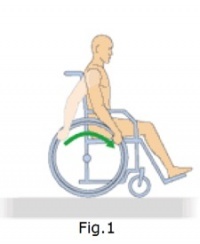 If the wheel is forward and the axle remains in front of the fingers, the user will initiate propulsion too far back and will not be able to complete the entire push stroke (Fig. 6). While if the axle is behind the fingers, the user will start propulsion more forward on the wheel and therefore have a shorter and less efficient push stroke (Fig. 7). 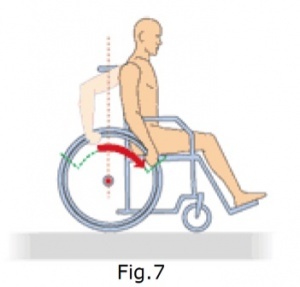 The stability of the wheelchair is also affected by the position of the rear wheel. If the wheels are backward the chair will be more stable (case of standard wheelchairs) but also will require more energy for propulsion. The “wheelie” will more difficult or impossible to achieve. Light chairs tend to have the rear wheels more forward than the standard wheelchair. In this case, you lose in stability but need less leverage and lower energy for propulsion. The “wheelie” will be also much easier. It is a dynamic position. Wheels smaller than 600 mm (24 ") are usually used for users with difficulty of movement in the shoulders or kyphosis column. Smaller wheels are also used in children's chairs so that the push ring stay at a height more appropriate to the length of kid’s arms. A long distance between the rear and front axles allows to maintain a more stable and straight course, but more energy is needed to rotate. A short wheelbase rotates easily and is easier to handle because it requires less energy for propulsion. ↑ 1.0 1.1 1.2 McLaurin CA, Brubaker CE. Biomechanics and the Wheelchair. Prosthetics and Orthotics International. 1991 Jan 1;15(1):24-37. ↑ Van der Woude LH, Veeger HE, Dallmeijer AJ, Janssen TW, Rozendaal LA. Biomechanics and Physiology in Active Manual Wheelchair Propulsion. Medical Engineering and Physics. 2001 Dec 1;23(10):713-33. ↑ 3.0 3.1 Vanlandewijck Y, Theisen D, Daly D. Wheelchair Propulsion Biomechanics. Sports Medicine. 2001 Apr 1;31(5):339-67.